1. Make a batch of rice cereal treats. 2. Press evenly into a greased baking dish. DM Tip: I like to use butter to grease the dish. 4. Use the cookie cutter to cut out shapes and remove from dish/pan. 5. Place a small dab of icing on top of cookie stick and insert into bottom of cereal treat. 2. Allow to slightly cool, but not all the way. 3. With your hands, form into a large egg shape. 4. Allow to cool completely on a piece of waxed paper. 5. Once the egg is cooled, decorate with small tubes of icing and candies. 6. 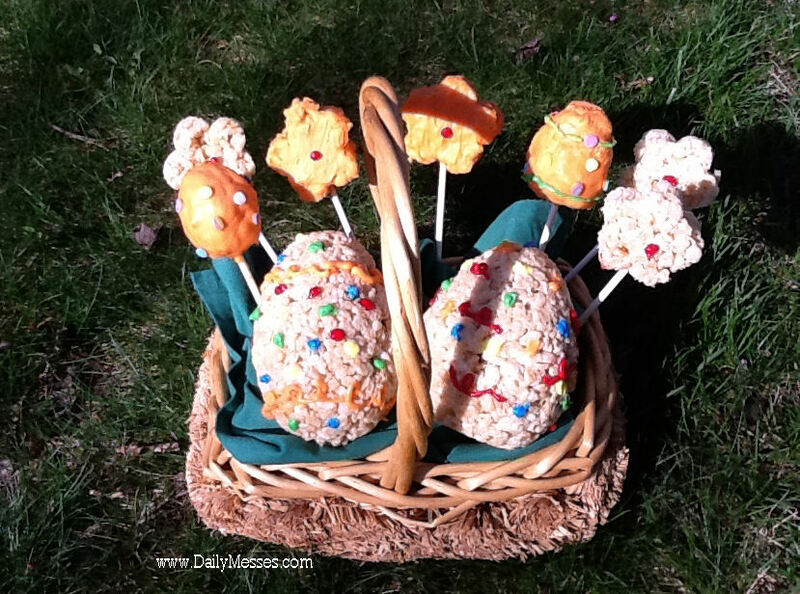 For the small egg shaped pops, form small egg shapes with your hands and allow to cool. Melt some candy melt and place a small dab on the top of a cookie stick and insert into the bottom of the rice cereal treat. Let set. Dip egg into melted candy and let excess drip off. Place standing up in a styrofoam block to set. Once candy melt has hardened, decorate. DM Tip: If you use sprinkles, decorate before the candy melt hardens completely.